Provincial Meadows Landscaping Southampton realise that the garden is an extension of your home. Your patio and landscaping can form a new area of the home to relax, unwind or dine. 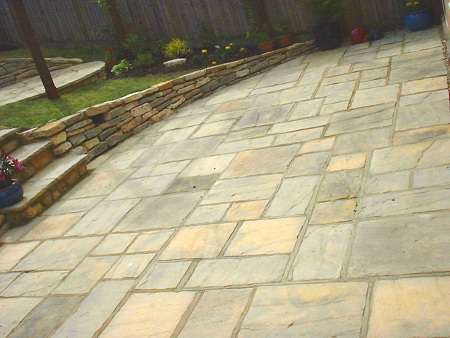 The patio area can be laid to your design with a variety of materials such as Natural Sandstone Paving. We can provide curved or circular patios without the use of precast kits. Our paving experts cut our paving slabs in situ to any shape or size required to suit your needs. Our patio installations are all carried out to incredibly high standards. We offer complete flexibility in design. In fact, we enjoy giving you honest and impartial guidance and advising you through the best materials and ideas. Alongside our paving options, we can also provide customers with expert shingle and gravel installations. Designed to provide your garden with an alternative look and feel. Our shingle and gravel allow you to have that natural stone look without the loose chippings getting into your home. Block paving is another well-known product that we use in patio installations. This little block is very hard wearing and is frost proof also. We use this block to cover any cuts we have to use in the laying of a patio. We consider ourselves specialists in the area of patios. Using only the best materials and most talented craftsmen to carry out a complete range of landscape services. 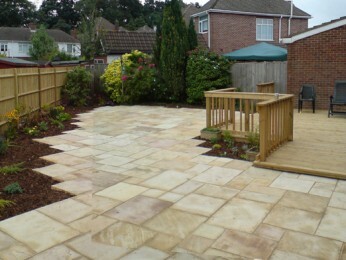 We provide our patio installation service across all of Dorset and Hampshire, including Southampton, Bournemouth and Poole. Provincial Meadows can enhance the look and value of your home with beautifully detailed patios. For more information, please contact us. We would be more than happy to discuss your options. We can also arrange a free, no obligation quote.